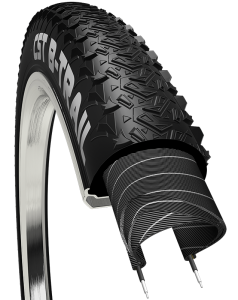 The CST Blackjack features a fast-rolling tread pattern with small, tightly spaced knobs for optimal rolling resistance while you’re ripping down the trail. The CST Blackjack in folding bead comes equipped with EPS protection and dual compound tread to help prevent punctures and keep you riding on the trail longer! The CST Blackjack comes in 26×1.95, 26×2.10, and 27.5×1.95 and it is available in both wire and folding bead.